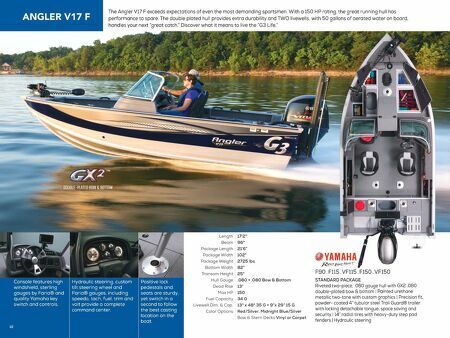 The Angler V17 F exceeds expectations of even the most demanding sportsmen. With a 150 HP rating, the great running hull has performance to spare. 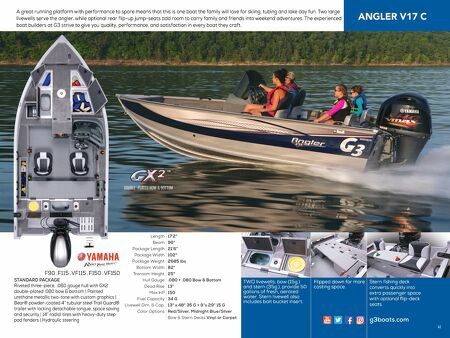 The double plated hull provides extra durability and TWO livewells, with 50 gallons of aerated water on board, handles your next "great catch." Discover what it means to live the "G3 Life." STANDARD PACKAGE Riveted two-piece, .080 gauge hull with GX2 .080 double-plated bow & bottom | Painted urethane metallic two-tone with custom graphics | Precision fit, powder- coated 4" tubular steel Trail Guard® trailer with locking detachable tongue, space saving and security | 14" radial tires with heavy-duty step pad fenders | Hydraulic steering Console features high windshield, sterling gauges by Faria® and quality Yamaha key switch and controls. Positive lock pedestals and seats are sturdy, yet switch in a second to follow the best casting location on the boat. F90 . F115 . VF115 . F150 . VF150 17'2" 96" 21'6" 102" 2725 lbs 82" 25" .080 + .080 Bow & Bottom 13° 150 34 G 13" x 48" 35 G + 9"x 29" 15 G Red/Silver, Midnight Blue/Silver Bow & Stern Decks Vinyl or Carpet Length Beam Package Length Package Width Package Weight Bottom Width Transom Height Hull Gauge Dead Rise Max HP Fuel Capacity Livewell Dim. & Cap. Color Options 40 Hydraulic steering, custom tilt steering wheel and Faria® gauges, including speedo, tach, fuel, trim and volt provide a complete command center.